“We went in with 64,” he recalled, “and six of us came out.” He won quite a few battle stars for his combat in the Pacific. “Did I do something wrong?” a puzzled Bauer asked. A solid hitter with the power, Bauer collected 8 first-inning leadoff career home runs. 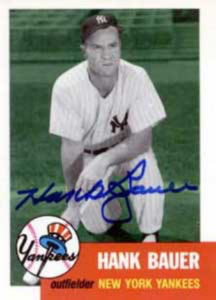 Playing on nine pennant winners for the Yankees from 1949 thru 1959, his favorite expression was: “Don’t mess with money!” When he saw a teammate he though was not putting out as much effort as though was required, Bauer used that phrase as a wakeup call. A Yankee for 1,406 games spread over a dozen seasons, a three-time All-Star, and one of Casey Stengel’s favorites, Bauer didn’t make mental mistakes and became testy when his teammates did. The Yankee time for Hank Bauer ended in 1960 when he was shipped off to Kansas City in a big trade that brought Roger Maris to the Yankees. It ended a Yankee career that spanned the the end of the DiMaggio era through the rise of Mickey Mantle.